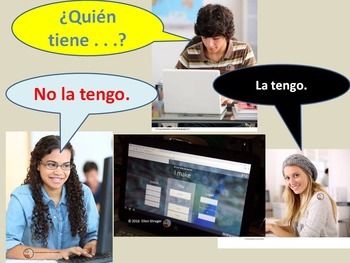 Highly engaged students can stay in the target language while working as a team, competing with others, and playing the Quizlet Live game! How? 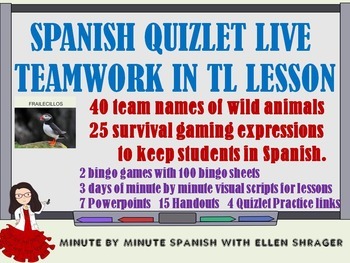 By directly instructing them for 2 days in 20 gaming expressions created just for this game and in the 40 animal names used for Quizlet’s teams. While they are playing, if I hear English, I make them choose a wrong answer and start over. They are motivated to learn this vocabulary. Includes 3 visual scripts for 3 days of lessons that will have them ready for a speaking assessment as they use French while they play on the third day! French Quizlet Live Game Now Available here! ♥ 1 Powerpoint with visual script for class day 3 in cludes previous slides with homework answers and Empty speech bubbles for students to use as practice in groups of three. ♥ 1 game with gaming vocabulary words and images. ♥ PDF of gaming vocabulary list French and English. ♥ PDF of “help” sheet with PowerPoint visuals but empty speech bubbles homework first night. ♥ PDF of word search for gaming vocabulary – for homework first night. •	Please go to your My Purchases page (you may need to login). Beside each purchase you'll see a Provide Feedback button. Simply click it and you will be taken to a page where you can give a quick rating and leave a short comment for the product. Each time you give feedback, TPT gives you feedback credits that you use to lower the cost of your future purchases. I value your feedback greatly and thank you for taking the time to leave it. Finally, thank you for being that kind of teacher who goes the extra mile for today's students. We need you now more than ever.